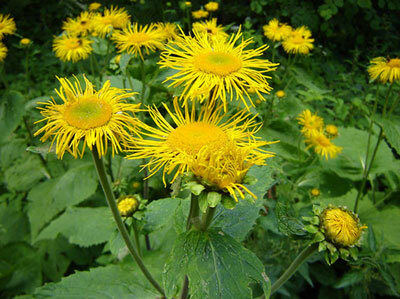 Elecampane is traditionally used for fighting infection and clearing dense, sticky mucus from the bronchial system. Elecampane is warming and is indicated for wet, persistent infections.While elecampane helps to remove layers of hardened, infected mucousa of the lungs, it allows for the secretion of a new layer of thin, clear mucous that is rich in immune factors. It can also be used to treat asthma and emphysema. Elecampane has an effect on lymph nodes, found in the adenoids, tonsils, small intestine, liver, and elsewhere in the body. The lymphatic system is one of the first systems in the body to respond to infections by circulating lymph, a substance that contains white blood cells. These white blood cells are needed to protect passages coming in from the surface (for example, the bronchial airway), to digest foods high in protein, and to process toxic materials. This formula can be made into a tea, syrup or tincture and is very effective in clearing up bronchial congestion. If making a tea, adjust flavors by adding more licorice, cinnamon and ginger to the formula. Combine dried herbs: 2 parts licorice root, 1 part cinnamon, 1 part echinacea, 1 part marshmallow, 1 part elecampane and 1/4 part ginger. Store in an airtight container and use to make a tea or tincture. To make a syrup, add 2 ounces of herb mixture or elecampane to 1 quart of cold water. Over low heat, simmer the liquid down to 1 pint. Strain the herbs from the liquid and put back in the pot. For each pint of liquid, add 1 cup of honey and mix them well. Take off the heat and bottle for use. You can add brandy to help preserve it longer but either way should last for several weeks to months in the fridge. Cautions/Contraindications: Take great caution with dry lung conditions and with pregnancy.